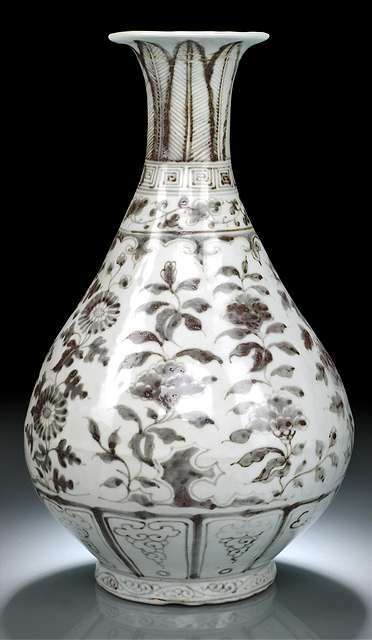 An identical vase with a reduced neck from the Sir Lionel and Lady Lamb collection is illustrated by J. Addis, ‘A group of Underglaze Red’, Transactions of the Oriental Ceramics Society, vol. 31, 1957-1959, fig. 4c. It is unusual to find flowers of the ‘four seasons’ as the major decorative theme on this group of bottle vases, although this floral combination is known to appear in underglaze-blue on large dishes. 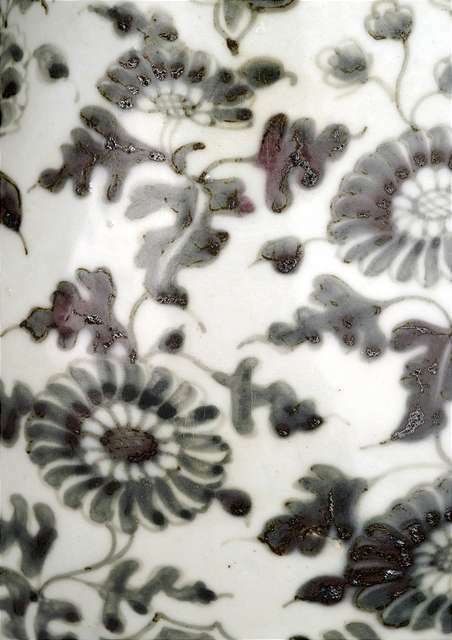 For three examples of these flowering branches painted on the well of dishes found at Dongmentou, cf. 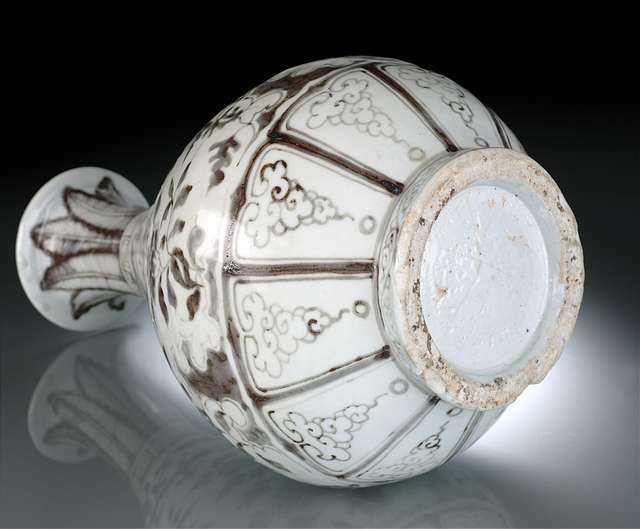 Imperial Hongwu and Yongle Porcelain excavated at Jingdezhen, Chang Foundation, Taibei, 1996, nos. 25, 26 and 27. Also see a dish, op. cit., no. 29, painted with long vertical stems of peony issuing from rockwork which is comparable in style to the present lot. The peony is the most popular of the main scroll designs, although chrysanthemum scrolls and lotus blooms are also recorded. 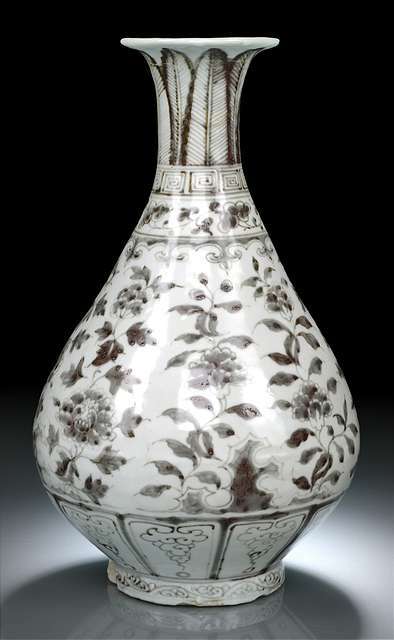 Compare the present lot with related examples, the first decorated with a peony scroll, Christie’s London, 5 November 1997, lot 901; the second with chrysanthemum scroll formerly from the T. Y. Chao collection, sold Christie’s Hong Kong, 19 May 1987, lot 225; and another bottle designed with broad lotus scroll, illustrated by R. Krahl, Chinese Ceramics from the Meiyintang Collection, vol. II, London, 1994, pl. 646. Another variation is the combination of freely painted garden plants of pine, bamboo and prunus, making up ‘the three friends of winter’; and for two vases of this theme see one from the Palace Museum, Beijing, illustrated in Sekai Toji Zenshu, vol. 13, no. 78; the other is illustrated in Mingdai Taoci Daquan, p. 75. Copper, used as the colouring agent, is known to be particularly unstable during firing processes and often resulted in examples that vary from a weaker shade of red to pale grey tones. For a detailed technical discussion of copper-red, see N. Wood, ‘The Evolution of the Chinese Copper Red’, edited by R. Scott, Chinese Copper Red Wares, London, 1992, pp. 11-35. 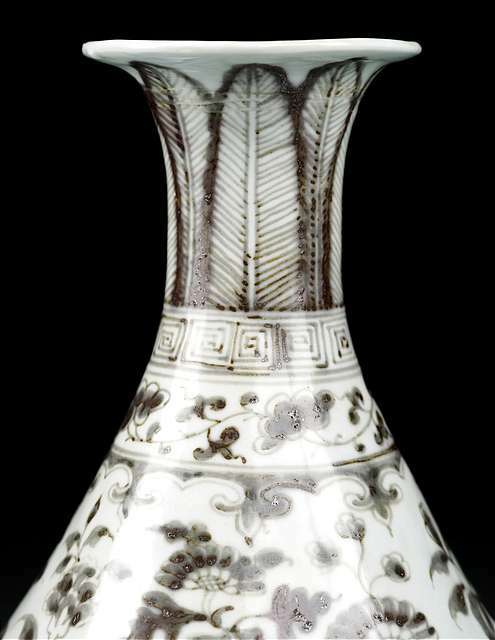 In potting, the Hongwu pear-shaped vases vary in thickness with the centre of gravity located at the the lower body, thinning considerably around the neck. 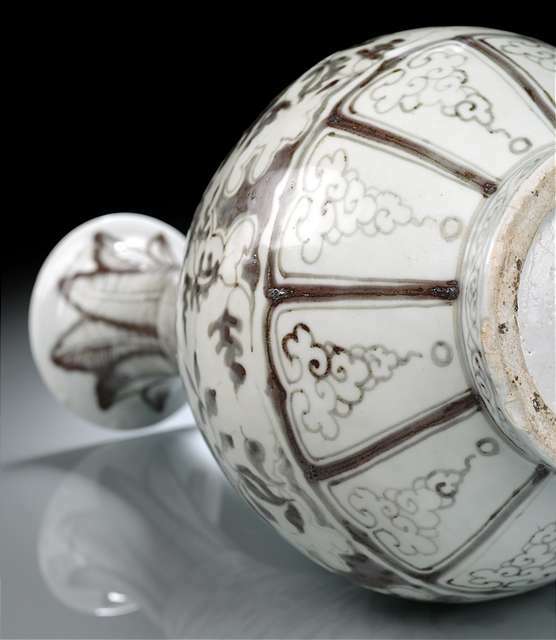 This general physical structure may explain the vulnerability of the neck area in most examples where the vases have been cut down after suffering damage or breaks, always in, or around, that section. she said is the absolute real hongwu. known as such. this is only for your information.